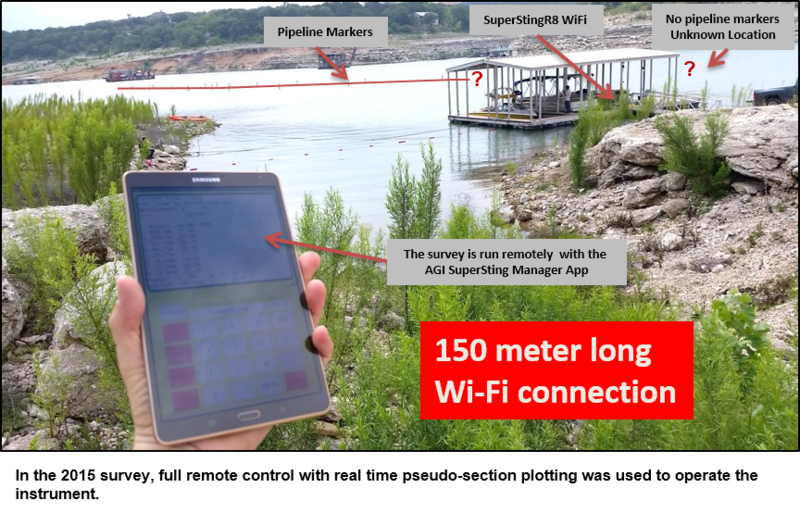 In May 2014 and May 2015, AGI conducted a hydrogeology workshop focused on training students to use a resistivity meter for groundwater exploration at Lake Travis near Austin, Texas. This workshop’s purpose was important: As water—especially groundwater—becomes more and more scarce (and thus, valuable) knowing exactly where and how to find it will become more crucial. By training students how to use our resistivity meter for groundwater exploration, we’re equipping them to help locate groundwater in all its forms. 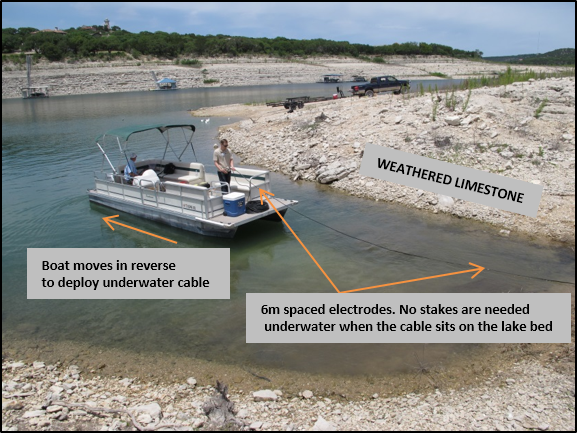 Instead of installing (think hammering down) electrode spikes into the ground, 28 electrodes spaced six meters apart on a graphite electrode cable were sunken to the lake bottom. In underwater applications, stakes are not needed; the water provides adequate contact between the cable electrode take-out and the bottom. 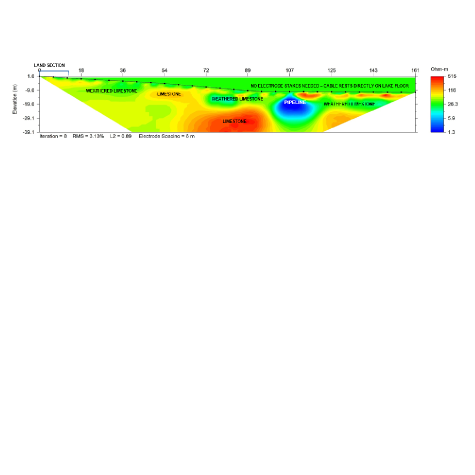 The system was used to rapidly measure a 2D array to locate a buried pipeline and map the limestone bedrock surface. 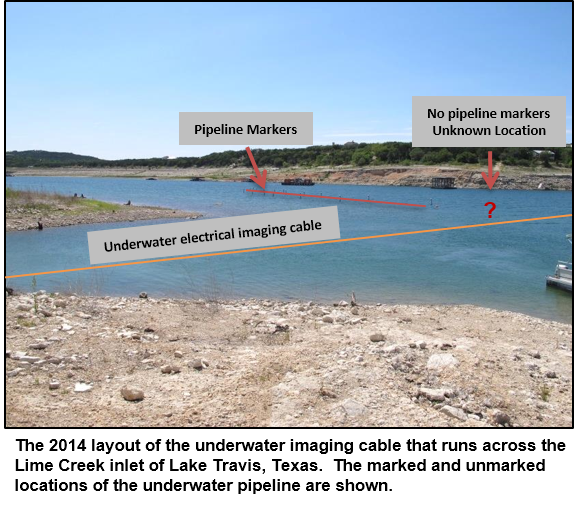 Underwater resistivity imaging mapped the limestone bedrock of Lake Travis and located a water supply pipeline. 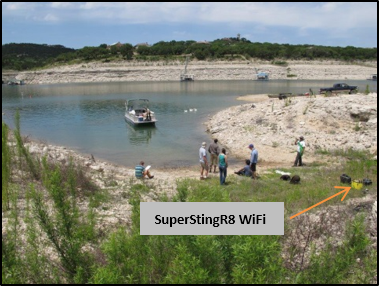 The exact location of a the water supply pipeline for the city of Cedar Park, Texas, was found in an unmarked location of the lake with the SuperSting™ R8 Wi-Fi and underwater marine cable. The pipeline design is steel with a 72-inch (~1.8m) diameter, which can provide 20-25 million gallons of water per day. Additional information regarding the surrounding limestone and weathered limestone was also imaged. 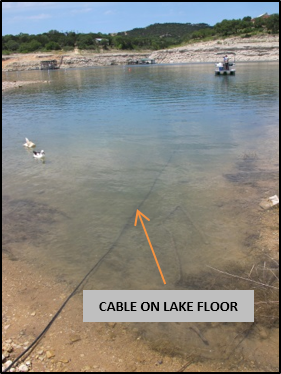 Ease of use: It’s easy to mobilize on water by floating or sinking a cable. Simply hold it still, and then move it when it’s done measuring. 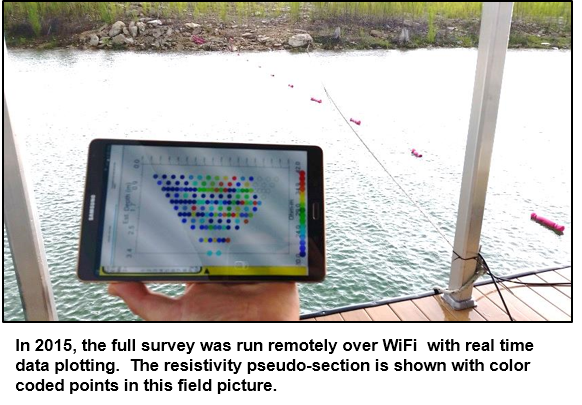 When you’re surveying waterways, rivers, estuaries, etc., you don’t have to install electrodes, because you are making contact to the bottom through the water. This is important and time-saving when you’re surveying waterways. Speed of data acquisition: The workshop highlights the system’s capability: Not only is it important to be able to move the cables quickly, it’s important to be able to gather data quickly. Specially designed tools: These rugged instruments are meant for marine work. Time- and money-saving: With our underwater exploration techniques, you don’t need to send down divers to explore—just pull the cable out and let it sink with a rope. Our clients can keep their employees safe and avoid the risk and expense of using divers, all while getting extremely accurate data. This is an easy way to explore underwater with a small number of electrodes (which is affordable and efficient). It’s an ideal choice for bottom investigation, as well as dam leakage and dredging planning.